In our family, it's tradition to put up our Christmas Tree the weekend after Thanksgiving! It's also a tradition to leave it up until at least January 6th. My dad grew up celebrating all 12 days of Christmas, and passed the tradition on to us! 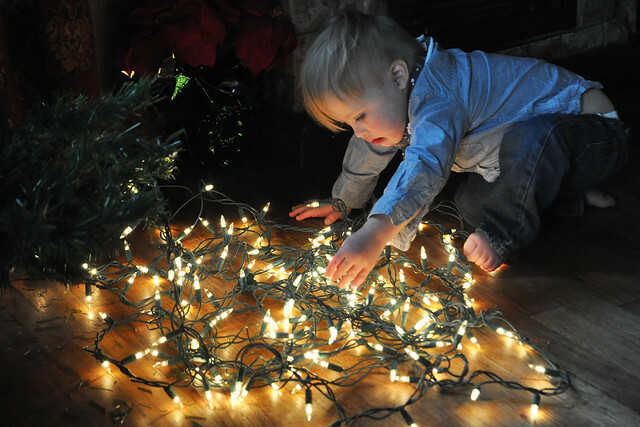 On Sunday afternoon, I put up the tree and strung the lights. 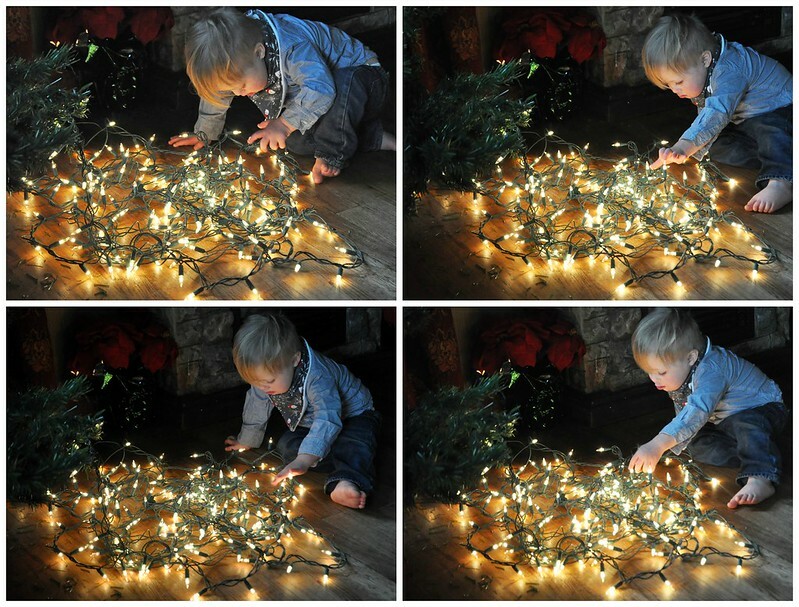 Liam insisted on helping! We ate dinner and had dessert before we began. A little bit of cleanup was involved! 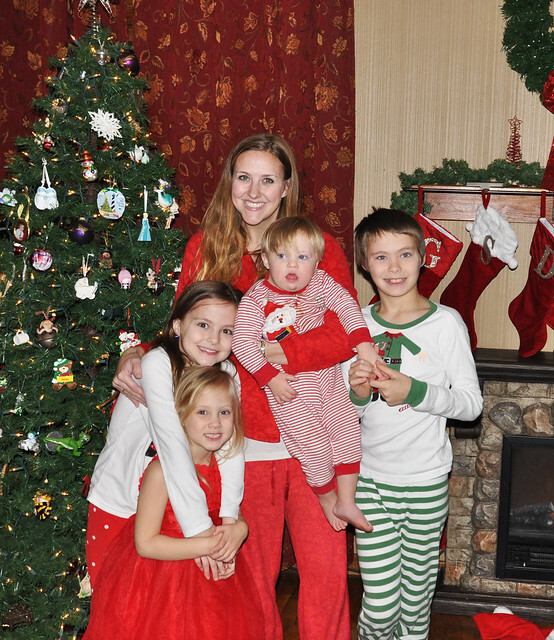 After dinner, everyone ran off to change into Christmas pajamas. Lily, of course, returned wearing a fancy Christmas dress. She definitely has a mind of her own! Finally, we all gathered in the living room! We have the same routine every year. 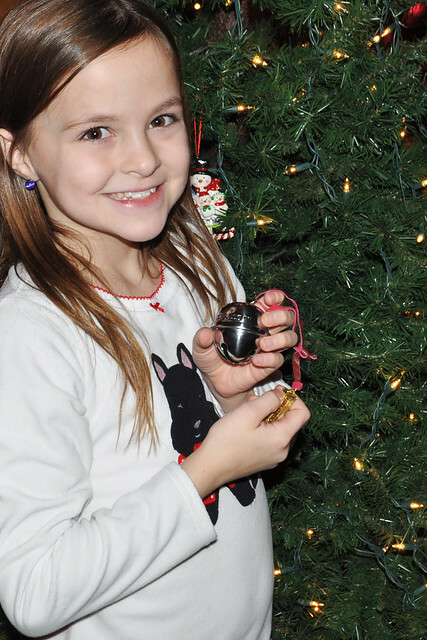 While Christmas music plays in the background, we decorate our tree one ornament at a time. 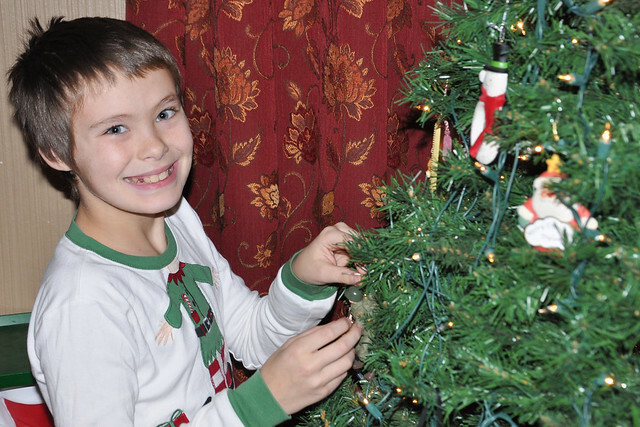 Grant unwraps each ornament, hands it to the person it belongs to, and that person gets to choose a spot on the tree. It takes a while, but it makes the tradition extra special! Each year, a different person gets to put the star on top of the tree. We keep a log on the back of the box, so there isn't any confusion. This year, it was Lily's turn! We all look forward to decorating our Christmas Tree. 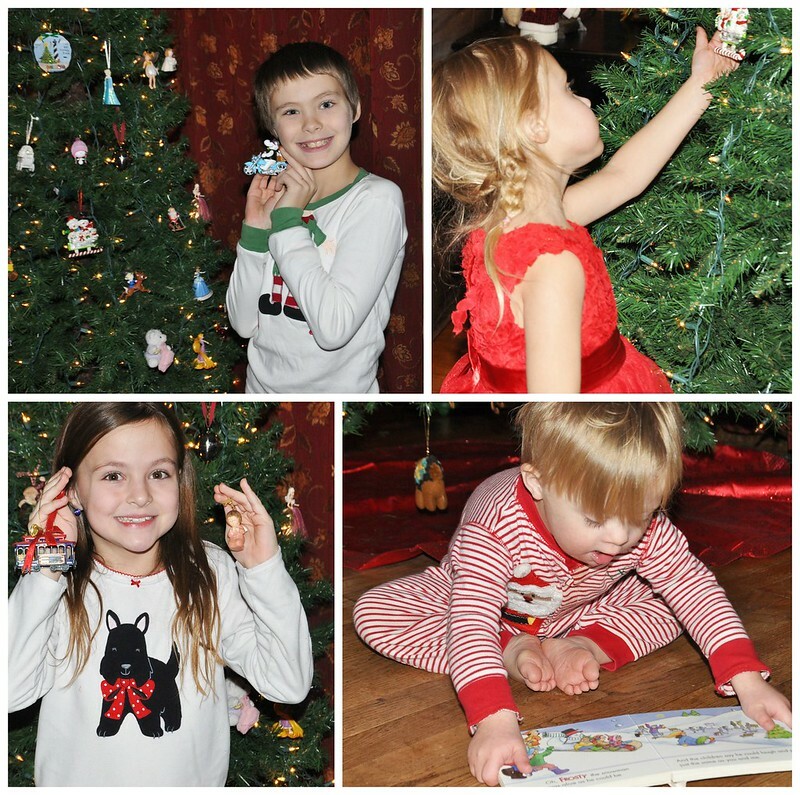 The kids love to rediscover their favorite ornaments, and Grant and I love to explain the history of the ornaments that we collected before they were born. It really is a great way to connect as a family! Our family really enjoys our Trimming the Tree Tradition, and it always puts us in the Christmas spirit! The ribbon, however, has yet to make its way onto the Christmas Tree! It will get there...hopefully before Christmas!!! 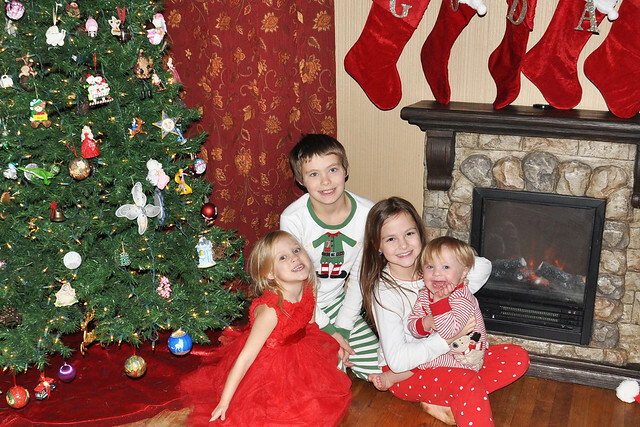 Final Christmas Tree Photo coming soon. I hope! You have such a beautiful family!! 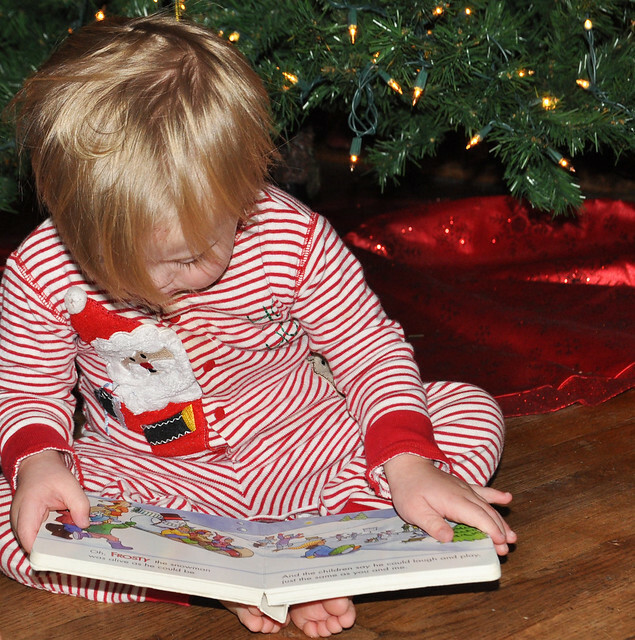 I love this tradition and your pajamas are too cute. Keep making beautiful memories, they will last a lifetime! Thank you so much, Sara! I really hope it makes a lasting impression on them! That is early! We always wait until after Dylan's birthday. I don't think our tree could handle being around a bunch of guests...haha! Thank you! I like your method. I would rather work on the tree and let my husband take care of the rest! You have such a beautiful family. I love how your little girl got all dressed up. Too cute! Your tree looks great and looks like you all had a lot of fun. Thank you so much! I had to laugh because she refused to change out of her dress. I guess we need to be fancy to decorate the tree! That looks like so much fun! We are putting ours up this week! How exciting! The family room always looks so much cozier after we put it up! What a lovely family tradition! 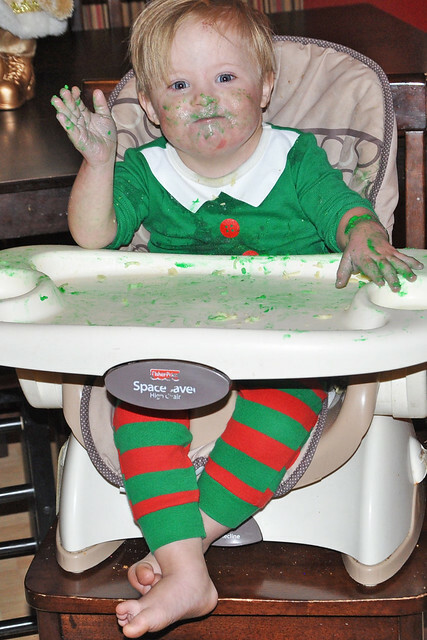 Your kids are going to cherish this memories forever. Love the PJs too! Thank you so much, Esther!!! I hope they do! I hope you are able to put it up soon, Melanie! Happy holidays! Those sound like great traditions! I'm off to find out what hallacas are! So sweet! I love that everyone gets so involved and helps out! Thank you! 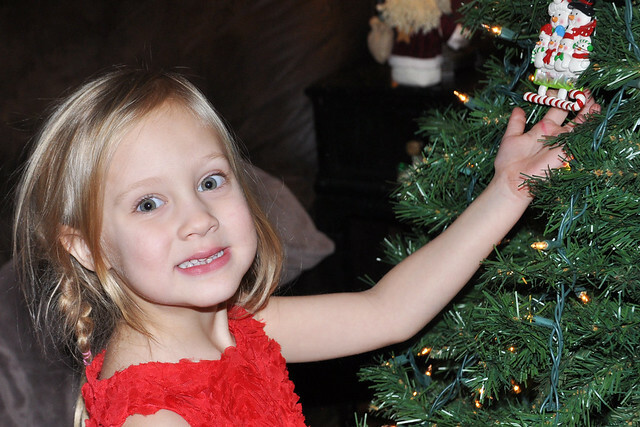 Lily wrote on her preschool project that putting up the tree was her favorite tradition. I'm so glad! What great traditions. We usually wait until after Emma's birthday (Dec 3rd) so that we can focus solely on her birthday and not lose it into Christmas. Since her birthday/slumber party was this weekend we STILL don't have our tree up yet. :( I'm kinda bummed that we're so late into December already without it. I hope to get it up this week, though. I completely understand! 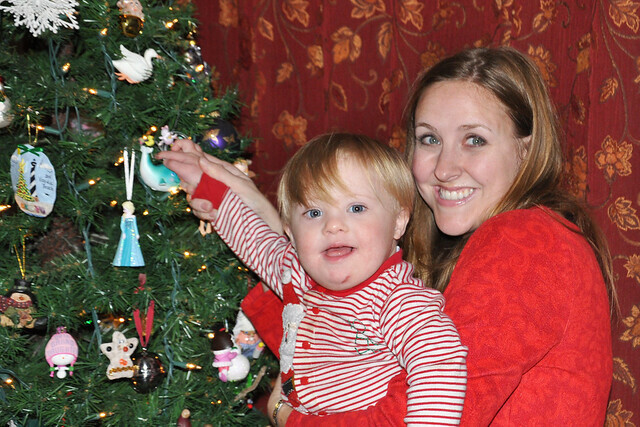 We wait until Dylan's birthday is over with before we put our tree up, too! Thankfully it usually happens just before or on Thanksgiving! Your tree is so pretty! The pictures of Liam and the lights look like a painting, rather than a photo. How pretty! Thank you so much, Tracy! I like how they turned out! We always put up our tree the day after Thanksgivng! I love that you celebrate 12 days of Christmas. I'm always so sad when it ends so it would be fun to stretch out the season a bit longer! That's exactly how I feel! Although, if I'm going to be completely honest, it is nice to reclaim the space after you take the tree down! 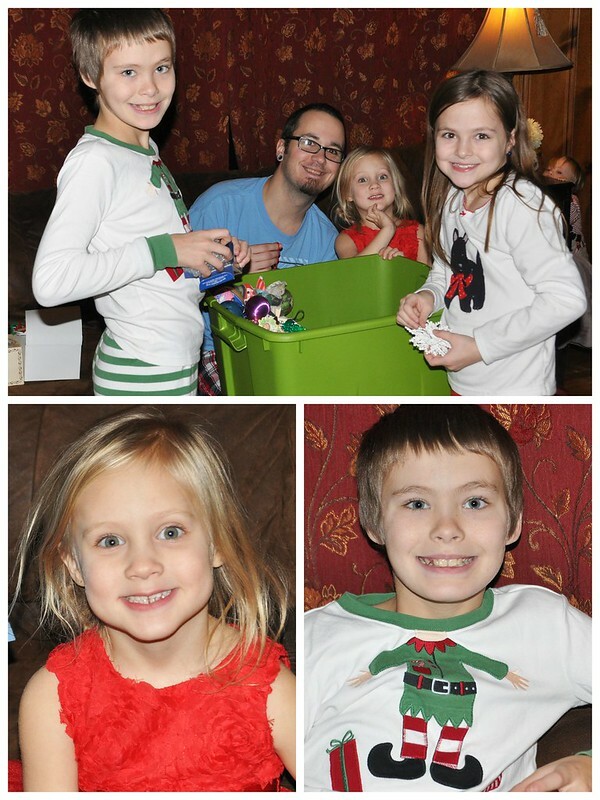 What a fun family tradition! 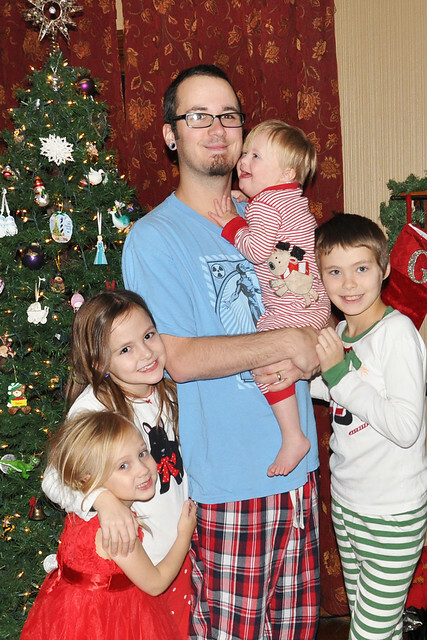 I love how all of you have special Christmas pajamas too. It sounds like Lily wearing her Christmas dress was perfect for the occasion since it was her turn to put the star on the tree this year! Beautiful! 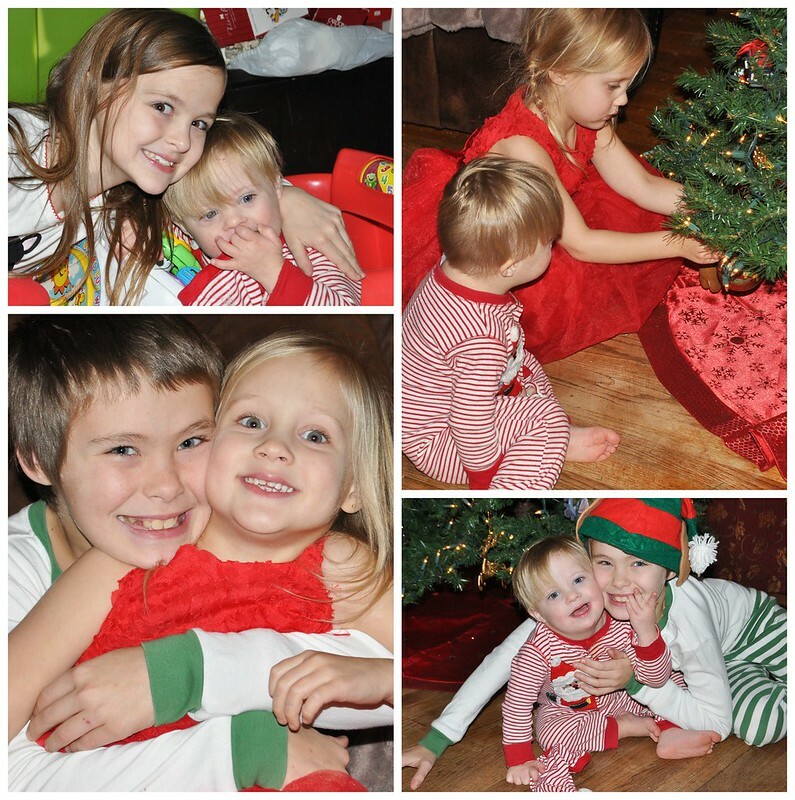 The kids looked like they loved trimming the tree...And all those pjs (and fancy dress) are so cute!